There’s no question that the multigenerational workplace encompasses a host of styles—from Gen Xers like me who love email, to Gen Z which is just as happy communicating via Slack. And although I believe we can learn from one another’s differences, I am always on the lookout for unifying commonalities that all the generations can agree on. Thanks to Capital One’s 2018 Work Environment Surveyresults, I have a new one to share: workplace wellness. This didn’t surprise me; after all, in today’s fast-paced work environment, we are all craving ways to fit self-care into our busy lives, whether that’s retreating to a quiet place or hitting a treadmill. But what did surprise me was that many companies are behind the curve—even though cultivating an appealing workplace culture is recognized as an incredibly powerful asset for attracting and retaining employees. For example, 77 percent of those surveyed said their employer does not offer environmentally friendly programs; 72 percent said they lack quiet, reflective spaces; and 71 percent reported no access to an onsite health center or wellness programs. 1. Get the healthy snacks already. When asked to prioritize a single onsite benefit they wanted, healthy food and beverage options was the top response from survey respondents across generations. The great news is that tasty healthy choices can be low cost and easy to provide. So ditch the donuts and offer fruit at meetings; add protein-rich nuts or trail mix to your vending machines; and invite the crew to bring a topping to share to liven up sad desk salads. 2. Add movement to the day. Smart workspace design can have an important effect on how much your team moves around. Encourage people to take the stairs in a multi-level office or hold standing or walking meetings. I deliberately moved my printer so that I have to get up every time I need to retrieve a printout. 3. Offer a menu of fitness benefits. Another option if your colleagues are up for it is to find an activity that combines social aspects with fitness. For example, form a team to participate in a local 5K and offer post-work training runs for anyone who’d like to join in. Offer a menu of fitness benefits. 4. 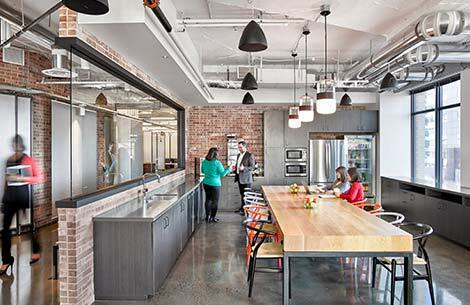 Promote wellness with flexible workplace design. I talk a lot about how offering choices is the best way to appeal to the multigenerational workplace, and I believe this is particularly applicable to wellness. A yoga devotee myself, I know that others love a high-intensity cardio class or prefer to hike. So see if you can eke out a small budget that employees can apply to any fitness activity or equipment they desire. Promote wellness with flexible workplace design. Open plan offices have been all the rage as a way to promote interaction, but for some people they just don’t work—whether you’re an introvert by nature or just need to concentrate on the spreadsheet in front of you. In fact the Capital One survey found that an overwhelming 85 percent of employees said that flexible workplace design is important. So consider how you might configure your workplace to incorporate both types of spaces that professionals said were important—open areas for socialization along with quiet, reflective spaces. While your top goal, of course, is happy employees, focusing on workplace wellness can lead to fewer sick days and less stress. And, the survey found, offering a variety of spaces can boost creativity, too. In fact, nearly 80 percent of employees said that an innovative environment encourages innovation, and 83 percent said that flexible workplace design leads to better ideas. And those are certainly workplace goals that every generation can agree on.